Visiting parishioners by their parish priest is a special occasion and mission at the same time to visit each home, talk to family members, care for those needy ones, sick, invalids, children, widows, orphans and all people of a good will. Clear practical advice for priests which are collected in this edition indicates that pastoral visitations turn into an opportunity for evangelization beyond a church. The Advisor outlines a changing in accent on Epiphany Day. Advisor “Pastoral visitations of parishioners on Epiphany Day” was published according to the decision of the Synod of Bishops of Kyiv-Galician Supreme Archbishopric of UGCC (Lviv, Briukhovychi, December 1-2, 2017: Session 77, Decree № 2). 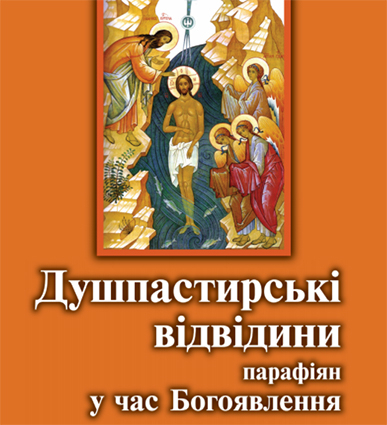 The text was written by Patriarchal Commission for Evangelization of UGCC in cooperation with a working group of launching the Strategy of UGCC development by 2020 (“The vibrant parish – a place to encounter the Living Christ”).